Fancy an evening of fine dining and magical music? Have you ever been out for the evening, expecting the best in dining and entertainment and been disappointed? Me too. Either the food lacks flavour or the vocalist lacks a voice. It can be difficult to find a restaurant in Torrevieja that delivers on the promise of a special night out. In 2018, Restaurante Christopher is changing this. We’re going to bring you special events evenings. Exceptional menus that live up to our billing as one of the best restaurants in Torrevieja, with entertainment that complements our reputation perfectly. 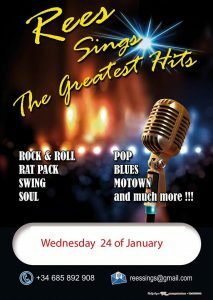 Our first evening of song and sustenance is set for Wednesday 24th January. We’re really excited to introduce Rees, who will be entertaining our guests on the evening of Wednesday 24th January. If you like the music of the Rat Pack, big band numbers, Motown, swing and blues, we think you’ll love Rees. Pair Rees’s soul with our Dover Sole. Perhaps a sample of swing to set off your steak. How about rock & roll with a rack of ribs? Add in a little seasoning of blues and pop, and of course the ever popular Rat Pack numbers, and you’ve got an evening to savour. Such a great evening deserves a special menu. Our chef, Neil Lloyd, is developing that as we speak. It may not be finalised until the week before. Why? Because we only use the finest available ingredients, with in-season vegetables. Before we create any of our special menus, we discuss with our suppliers. Sometimes weeks in advance. Our aim is to source the best meat and fish. Then we create a menu that showcases this quality. The result is a special evening for you. Eat á la carte, from our evening menu, or our special set menu for the evening. The choice is yours. Tables for this event have already started to sell. To avoid missing out, call us on (+34) 600 01 28 24 to book your table and enjoy an evening to remember at one of Torrevieja’s top 10 restaurants (as rated by diners on www.tripadvisor.com).